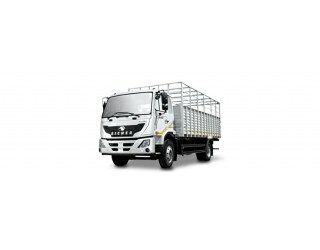 Dec 27, 2018: The Eicher Pro 3012 gets a deck body and comes with a wheelbase of 4,300 mm. The payload capacity of 6,622 kilograms is pretty good and assures that the truck can carry midweight things quite comfortably. Inside the cabin, the tilt and power steering comes with telescopic forks that make the driving a bit more convenient. Coming to the safety features, there are air brakes with ABS, which manages to provide good stopping power. Up front and rear, the parabolic unit with anti-roll bar and semi-elliptical laminated leaves with helper leaf spring respectively are present for the suspension setup. The four-cylinder engine pumps out a maximum power of 135 bhp along with a peak torque of 450 Nm. It is mated to a 6-speed manual gearbox.